If you’re interested in exploring either the scenic Santa Fe River or the historic Suwannee River, in Natural North Florida, check out Anderson’s Outdoor Adventures. They offer rentals of canoes, kayaks, paddle boards and pontoon boats from their 4 locations. The Santa Fe location is located at the FL47 bridge. There, you can park and be shuttled upriver for a leisurely float downstream. Be sure to call ( 352-507-0059) for hours of operation and prices. Blue Springs in Gilchrist County is nestled along the Santa Fe River in the heart of spring country half hour north west of Gainesville, FL and is at the top end of the Gilchrist Blue Way Paddling Trail. Blue Springs is a heavenly escape from everyday life and hurried vacations. Swim or float in a tube in the crystal-clear blue waters, walk the boardwalk along the spring run, and camp at our fully-equipped campground. Enjoy a picnic, a friendly game of volleyball, or paddle the scenic Santa Fe River. 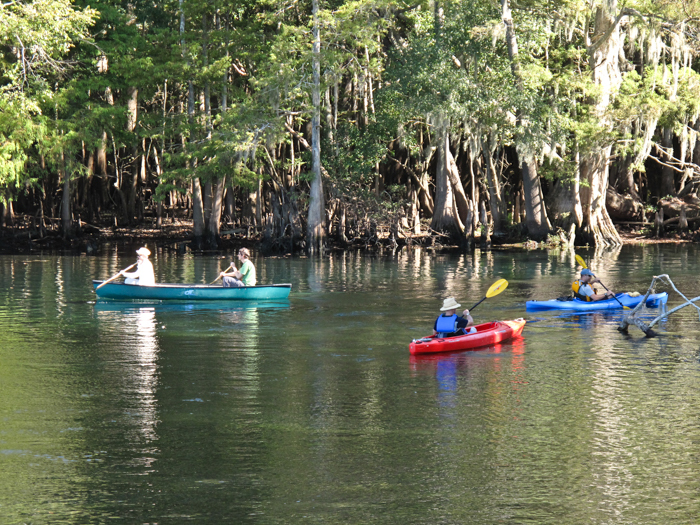 Anderson’s onsite canoe,kayak, and paddle board rentals are located directly at the head springs! At Hart Springs, onsite Canoe, Kayak, and Paddle Board Rentals are available all year round as well as Pontoon Boat Rentals! Manatee SpringsState Park is located 7 miles from Chiefland, FL off of Highway 19. Hosting a first-magnitude spring that produces an average of 100 million gallons of crystal clear, cool water daily makes this park an ideal spot for diving, snorkeling, and swimming. The sparkling spring run meanders through hardwood wetlands to the Historic Suwannee River. Canoe and Kayak rentals are available all year round from Anderson’s Adventures.